Earlier this year Ben & Tracy sent me a picture of a cake that they loved and asked if I would be able to recreate it for their wedding. 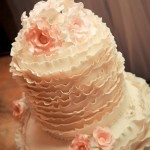 You may be familiar with the design of the 5-tier ‘half and half’ cake, originally by Shockley’s Sweet Shoppe. Funnily enough, just days before their request I had actually been looking at a picture of the original and thinking that I’d love the challenge of attempting to make it myself! 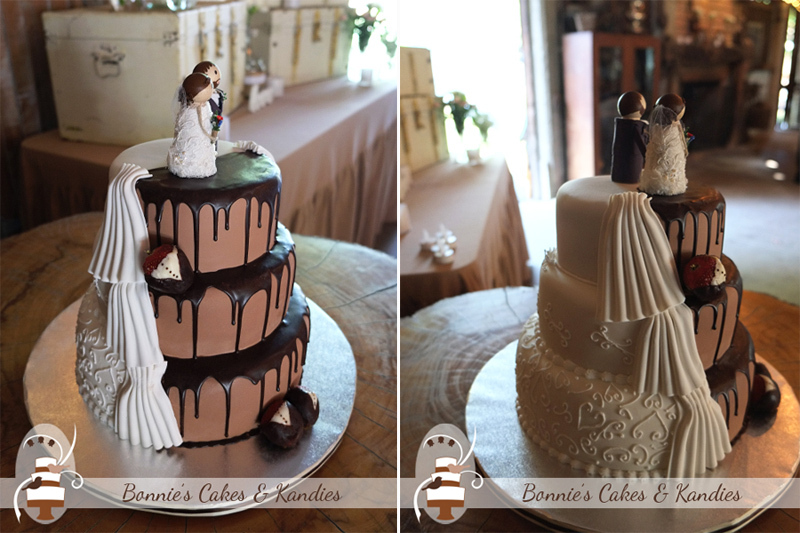 Self-confessed chocolate lovers, Tracy and Ben chose dark chocolate mud cake for their middle and bottom tiers and a gluten and egg free chocolate fudge cake for the top tier. 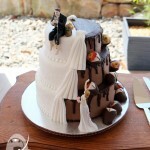 The ‘chocolate’ half of the cake was decorated with dripping, dark chocolate ganache and tuxedo-wearing strawberries. 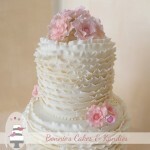 Piped embroidery and fondant pleats were used to decorate the other half of the cake. 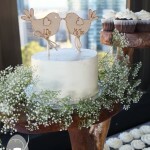 I placed my cake signature – two little lovebirds – at the base of the top tier instead of piping on the side, to add a little bit of interest while keeping the top tier egg-free. 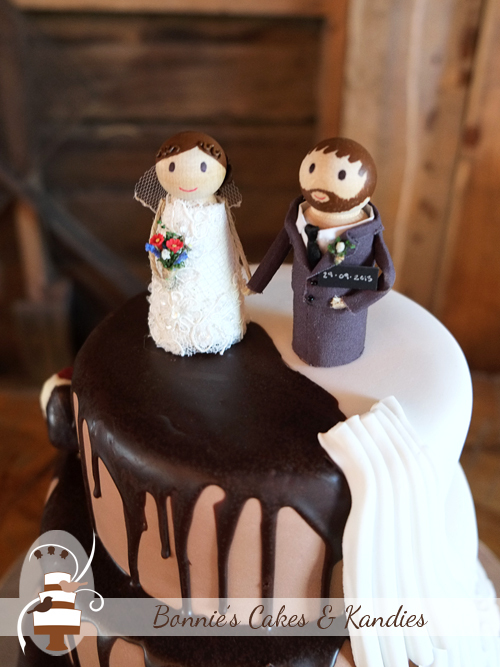 Tracy herself made the adorable cake toppers, complete with a little bouquet and the date of their wedding. She did a wonderful job – I think they look great! 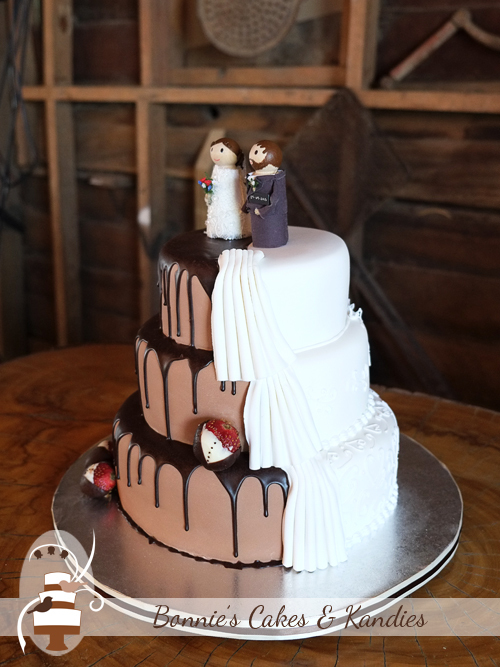 This cake travelled all the way to the Boomerang Farm on the Gold Coast, and I’d like to give a special mention to the groom’s parents who bravely transported the completed cake to the venue. 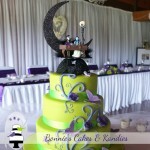 Delivering tiered cakes is not for the faint-hearted, especially when you have a long drive, heat, and winding roads to contend with! 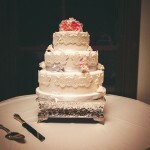 Ben & Tracy, thank you for trusting me with the job of creating your gorgeous wedding cake. It was such a pleasure and I wish you much happiness and all the very best for your future together.